Chemicals in ordinary, mass-manufactured mattresses seep into the air you breathe. Those gases can cause health complications that can have permanent effects. These chemicals do nothing to prevent the mold, dust mites, bacteria, and mildew that can accumulate in your mattress, causing discomfort, allergic reactions, and respiratory issues. None of which make for a good night’s sleep. So the question is: do you want more chemicals in your life? The Natural Sleep Collection by Gardner Mattress features organic cotton padding, not chemically treated and naturally resistant to dust mites, mildew, and bacteria. 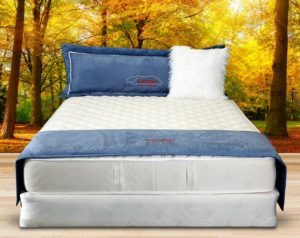 It represents a step towards both healthier living and healthier, more restful sleep. Further, we specialize in pre-compressing our upholstery to prevent sagging and depressions, unlike other mattresses. It’s the same level of care we invest in our traditional collection but with an organic sensibility. You spend a third of your life asleep, so it’s worthwhile to invest in your rest. Invest in a chemical free life. Invest in a mattress that will give the best comfort, naturally.